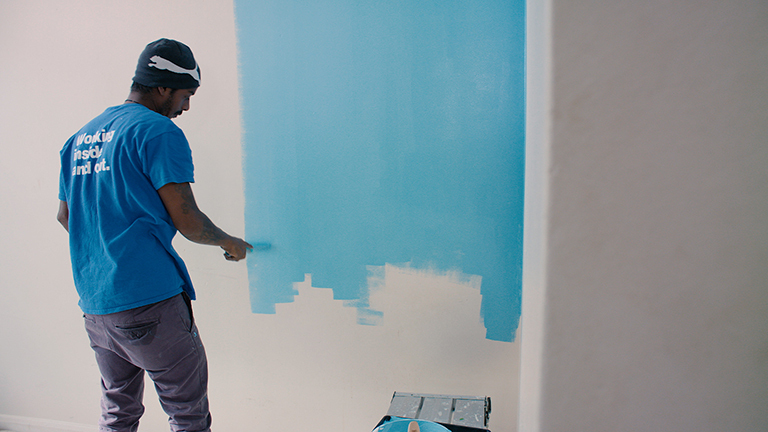 A charity and social enterprise that acts as a bridge between prison and employment, Bounce Back works with offenders coming to the end of their sentence, training them in Painting and Decorating to help them secure a job and a future on release. The process is actually quite simple. The Bounce Back Charity offers training programmes in construction skills in HMPs Brixton and Wandsworth, as well as Construction Skills Certification Scheme (CSCS) training in a number of other prisons. Training courses can also be accessed by ex-offenders in the community. 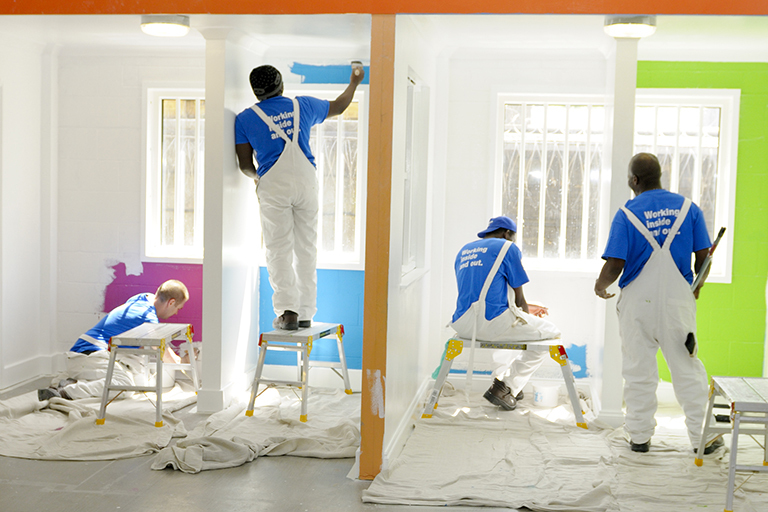 In prison, inmates can enrol on courses in Painting and Decorating, Dry Lining, and Scaffolding (the first ever scaffolding training centre within any UK prison), which last for 8-10 weeks. The training courses run in the community are shorter, lasting 4 weeks, followed by two weeks of voluntary work experience. This enables Bounce Back to get their participants into paid employment earlier, continuing their training in the workplace. Once qualified, ex-offenders can join teams of professional painters and decorators put together by the Bounce Back Social Enterprise. These teams work for private clients on domestic and commercial projects, as well as major projects with large construction companies. It is a genuine 'end to end' process, engaging with and supporting trainees (and their employers) from their time in custody to their entry into the workplace. These programmes have been a great success. So far, over 300 individuals have been through a training course, and less than 12% of those have reoffended, staggeringly low in comparison to the national average reoffending rate of 60%. It also has an 85% success rate of people leaving prison either going into further training or employment. Bounce Back is an organisation that is truly helping ex-offenders turn their lives around, and we want to share with you some of the personal successes of those individuals involved with Bounce Back. Meshack completed the Bounce Back Painting and Decorating and Dry Lining courses whilst still in prison. He was cleared for release on temporary licence (ROTL), allowing him to undertake activities within the community whilst still in custody, and began work with Bounce Back as a painter & decorator after gaining his CSCS in the community. A vacancy became available to attend a Sector Based Work Academy (SBWA) to gain more skills. He completed this, receiving many construction qualifications including Manual Handling and Team Work, Health and Safety in the Construction Environment, Employability Skills, Vehicle Banksman (Traffic Marshall), Working at Heights (PASMA), and Abrasive Wheels. He began work with Measom in Dry Lining shadowing experienced Dry Liners. Work slowed down and Meshack came back to work for Bounce Back when he was released and has done so ever since. He has been promoted to site supervisor and will be nominated for a Land Securities Award. Damilare has overcome many difficulties, such as disability, to be a success with Bounce Back and is a good ambassador for perseverance and change. After completing the Bounce Back course, he was cleared for ROTL and gained his CSCS through Bounce Back, subsequently working with them for 2 months. A position became available on the SBWA which he attended. He was deemed unfit to work on a large construction site as a safety risk, but has worked with Bounce Back since March 2016 and is going from strength to strength whilst still on ROTL. So what of society's response? Clearly Bounce Back is able to successfully prepare individuals for the working world, and many may support the employment of trained ex-offenders on major commercial projects with large construction companies. But do members of the public feel as comfortable with the idea that the people who are refurbishing their homes are ex-offenders? The answer is undoubtedly yes. The impact of the work Bounce Back carries out is felt by far more than just the individual ex-offender. Yes, Bounce Back gives these individuals the opportunity to productively re-engage with their community by being given the necessary skills, as well as the self-confidence, to gain employment and ultimately cut reoffending. But in return, both the employers and customers of these ex-offenders benefit from a hard-working, reliable and professional team. Everybody wins.